Murphy Bed Shipping And Installation Services | Lancaster Handcraft, LLC. No matter where you live, we can deliver our quality, solid wood, handcrafted Amish Murphy Bed and cabinetry direct to you, at a reasonable price. We have a proven track record of hundreds of successful projects that span from sea to shining sea and beyond. 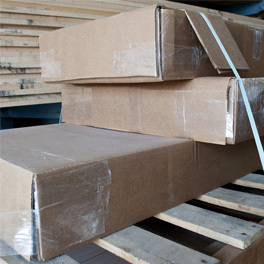 Our products are carefully packed and boxed in-house to ensure that they will arrive to you safely and without damage. However, it is important that you inspect your furniture for any damage that occurred during transport. Before signing for the receipt of your furniture and releasing the driver be sure to carefully inspect your new purchase. Any items that were damaged during shipping must be rejected and sent back with the driver on the original delivery or you could be responsible for shipping those items back to us for repair and return. Our curbside delivery costs are standard all across the continental US - $550 per bed / $650 per bed and 2 cabinets. White glove service is available upon request for an additional charge. 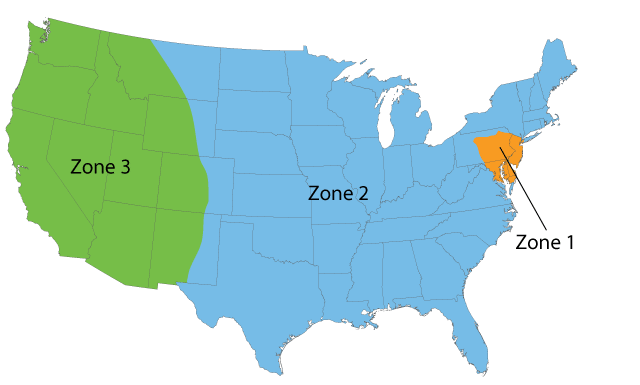 Transit times per shipping zones vary. If you are outside the Continental US, there is no need to worry, overseas deliveries can be arranged as well. We want everyone in all parts of the world, to be able to enjoy our quality craftsmanship and the flexibility our Murphy Beds can provide. The Murphy Bed face panel and cabinet are shipped unassembled and flat making it easy to carry into small rooms. The parts are carefully packed into 3 packages that are 6 inches high and weigh no more than 80lbs each. Side cabinetry is also packaged but comes fully assembled. 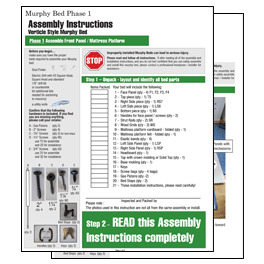 Easy-to-follow installation instructions will guide you through the installation process. This is considered a light to medium handyman job. We compare our Murphy Bed installation with bracket mounting a big screen TV or hanging a set of large storage cabinets to the wall. Support is available 24/7 via phone or video conference. Get a quick glimpse of Lancaster Handcraft's Murphy Bed installation process and the steps that it takes to properly install your Murphy Bed. This is not an instructional video. If you are lucky enough to live in the areas surrounding Lancaster County (Zone 1 on the above map), we offer full-service delivery and installation. Lancaster Handcraft's team of trained installers will carefully blanket wrap, pack, deliver, carry in and install your Murphy Bed and matching cabinetry. Our service area includes parts of Pennsylvania, Maryland and New York. We service Washington DC and all of it's surrounding towns and suburbs as well as the 5 boroughs of New York City. 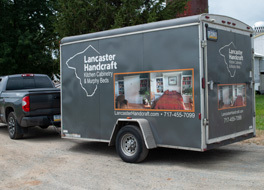 If you travel the I-95 corridor keep an eye out for the Lancaster Handcraft truck and trailer and be sure to wave! Pricing for this is based on location and scope of job. Please contact us for a quote. "Lancaster Handcraft recently installed a Traditional Murphy Bed in my guest room. The workmanship that went into this solid wood piece is impeccable! It’s absolutely stunning. It’s sturdy and I suspect it will last a lifetime."